Legacy 2030 | Winston-Salem/Forsyth County Planning Board: Piedmont Triad Aerotropolis? New York Times Columnist Roger Cohen Weighs In on Aerotropoli. 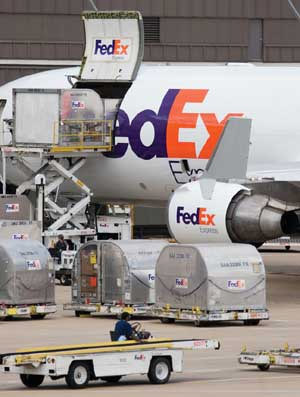 The completion of the FEDEX Mid-Atlantic Hub and a second major runway at the Piedmont Triad International Airport has created the opportunity for our region to become one of the few cargo “Aerotropoli” (airport cities) in the nation along with Memphis, Tennessee, Forth Worth, Texas and Milwaukee, Wisconsin. According to Dr. John Kasarda from UNC-Chapel Hill, airports have evolved as drivers of business location and urban development in the 21st century in the same way as highways in the 20th century, railroads in the 19th century and seaports in the 18th century. An Aerotropolis is a powerful engine of local economic development, attracting air-commerce-linked businesses to the land surrounding major airports. An Aerotropolis typically attract industries related to “just-in-time delivery” for manufacturing, e-commerce fulfillment, telecommunications and logistics; exhibition centers; and offices for business people who travel frequently by air or engage in global commerce. Clusters of business and industrial parks, distribution centers and wholesale merchandise marts (such as the International Home Furnishings Market in High Point), locate around the airport and along the transportation corridors radiating from them. While much of this economic development potential is linked to the Piedmont Triad International Airport, Smith Reynolds Airport also provides a locational advantage, particularly for time-sensitive delivery of biomedical products that originate in the Piedmont Triad Research Park. The Piedmont Triad Region is also one of the few metropolitan areas that will have four interstate highways passing through: I-40, I-85, I-73 and I-74.